Cancer is ruled by the Moon, seeing over the mind, memory, and emotions. Being a water sign, they are sensitive, emotional, empathetic, and can easily resort to tears. When threatened, they can often become withdrawn and pull into their shell like the crab, their symbol. Their home and family are very important to them, and are often protective of those dear to them. 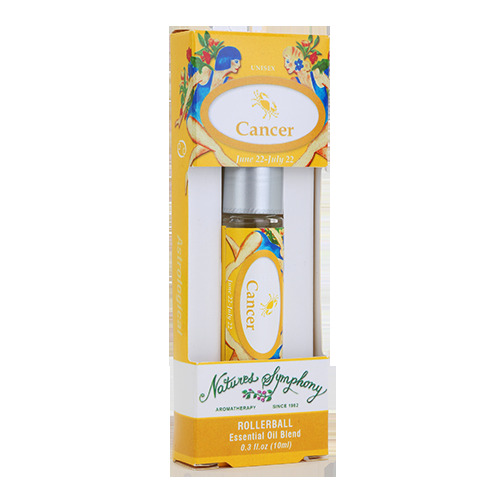 This blend includes oils ruled by the sign and in tune with Cancerian nature. To Use: Gently glide over pulse points, temples, back of neck, and forehead as desired. Avoid eye area. For external use only. Ingredients: Fractionated coconut oil (Cocus nucifera), with Organic/wildcrafted essential oils of lemon (citrus limonum), camphor (cinnamonum camphora), German chamomile (matricaria chamomilla L), jasmine(grandaflorum). Contains only pure essential oils.